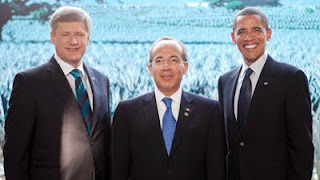 Out of the ashes of the defunct Security and Prosperity Partnership (SPP), the U.S. has pursued simultaneous bilateral agendas with both Canada and Mexico, in an effort to further deepen North American economic and security integration. While the NAFTA framework remains intact, a recent announcement by Canada and the U.S. to work towards a trade and security perimeter agreement without Mexico, has some questioning the future of the whole trilateral process. Canadian Minister of Foreign Affairs Lawrence Cannon recently addressed the Council on Foreign Relations where he emphasized Canada-U.S. bilateral achievements and called for greater integration between the two countries. In his speech, Minister Cannon praised the February 4,Beyond the Border declaration issued by President Obama and Prime Minister Harper as, “a bold new step, intended to bring our economic competitiveness and our security perimeter to a higher level of joint commitment.” In regards to shared engagement in the hemisphere, he added, “Our Americas strategy is focused on promoting prosperity, democracy and security.” Cannon acknowledged, “We are working with the U.S. to help Mexico strengthen its police forces and judicial institutions to combat transnational, organized crime.” He also added, “The problems on the U.S. southern border are real but fundamentally different from those on your northern border.” Some have blamed the failure of the SPP on the trilateral approach and believe that it also prevented more meaningful Canada-U.S. bilateralism in areas of security, trade and energy. ← Real ID Mandatory State Compliance by May 11, 2011?